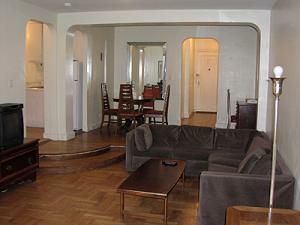 Chelsmore Apartments offers fully furnished apartments for short and medium term stays in Chelsea. These apartments are an excellent alternative to hotels as they provide our guests with a spacious, comfortable setting at very reasonable rates. It is an ideal setting for professionals, academics, corporate clients, or seasoned travelers, who want a quiet and cozy setting for maximum comfort and productivity. Conveniently situated 1 block from 1, 2, 3, A, C, E, F, and L trains, 10 minutes from Midtown and the Financial district, and walking distance from many New York attractions. Chelsmore Apartments provides the following amenities in each of our apartments: full furniture (Sofa set, queen size bed, dining set, etc), bathroom, closets, full kitchen, cable TV, linens, kitchenware,phone (with direct number, voicemail, and internet capable), heat, gas, hot water. The building is pre-war Art Deco with beautiful details, spacious layouts, 24 hour concierge, and coin-operated laundry facilities. All the apartments are recently renovated with modern appliances. This and other New York City properties can be found here online in The Register.